This is Belgium’s version of the Galibier, Tourmalet or Stelvio. It might not be the highest nor the hardest but its name is celebrated as a place central to the sport’s history. What’s it like to ride? The Route: the wall section of the climb is right at the top of the hill. There are many ways to reach this short cobbled road but the map above grabbed from Strava shows the classic approach from the Dender river, across the market square and around to the start of the infamous “wall” section. In total it is 1km long with an average gradient of 8% and a max of 20%. The Feel: many climbs begin before their official start point, you can often be toiling up an Alpine valley before a famous mountain pass begins. It’s the same here, you start climbing through the town of Geraardsbergen before hitting the Muur section. Start at the bridge and Brugstraat (“Bridge Street”) and go over the urban cobbles to reach the large market square. Normally the race thunders through but there’s no harm dawdling for a moment, there’s a Manneken Pis statue to gaze at if you haven’t seen his famous brother in Brussels. Ride on and there’s the sense you’re going the wrong way as the hill is over your right shoulder. At first the cobbles are even and smooth like tiles on a bathroom floor but the more you leave town the rougher they get. As the houses give way to garages and trees the gradient picks up and you arrive at what looks like a dead end: there’s a cobbled staircase ahead and to the right a cobbled path, each little more than two metres wide. Where did the road go? It’s the track to the right and it’s here that the “wall” arrives with rough cobbles. The road is cut into the hillside and the muddy banking brings dirt onto the road. This is the hard part but it’s short, a couple of hundred metres although they pass as a slow as you’d expect on a 16% cobbled climb before you turn and catch sight of the chapel at the top. Yet it’s nothing like the Ronde with its roaring crowds. This is a very civil climb, elegant even. Our sport mythologises it as a scene of battle, pain and decision but for the most of the year locals loiter and stroll. Gone are the crowds, a few couples walk children and dogs. Even when there’s no race on many cycling photographers capture the cobbles and the chapel, suggestive of Calvary and the Via Dolorosa with all the loaded imagery of crucifixion and hardship. In reality there’s a beer terrace just out of the shot. Arrive at the top and you wonder what all the fuss is about. The Verdict: most of the climb is in the town, the wall section is only the final part of this. Often decisive in the Tour of Flanders, sometimes a coronation, the legendary status probably owes more to its position in the race than its gradient or rough cobbles. It’s crushing after 240km but on a shorter spin it’s not too bad. While the sport loads up on religious iconography for locals this seems to be a pleasant place for a walk and a beer. The History: Geraardsbergen is a collection of villages around the Dender river and below the Oudeberg, a strategic hill that had fortifications of various kinds at the top plus a chapel as the illustration above suggests. The Race History: For cycling this climb is much loved, steeped in history and the symbol of Flemish cycling tradition? Not really. It was used regularly in Gent-Gent since 1950, the race which has since become the Omloop Het Nieuwsblad and tried a couple of times in the 1950s in the Ronde van Vlaanderen. It wasn’t until the 1970s that the Ronde started to use it regularly. It quickly became central to the race’s identity because of the finish in nearby Meerbeke meant the Muur was highly strategic and only a few riders were usually left in contention by then. When the race finished moved to Oudenaarde in 2012 the Muur was dropped as the organisers preferred other climbs like the Paterberg which are not only closer to the finish but offer space to install giant VIP zones and charge entrants for the wining and dining. 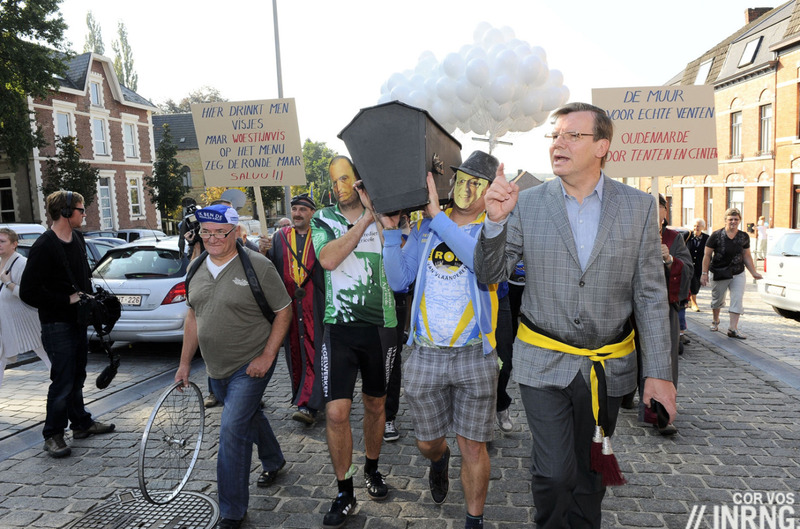 Disgusted residents of Geraardsbergen staged a protest complete with a coffin to symbolise the death of the race. In truth the Ronde is flourishing but it does miss this climb. In reality though locals say this climb lost something when it was resurfaced over a decade ago and the brutal cobbles near the top were replaced by something smoother. The pavé is still hard going but nothing like the rutted, jutting stones that used to line this road. Say it: Muur means wall. Geraardsbergen is harder for non-natives with the G sounding more like an H, almost as if you’re clearing out your throat. Hear for yourself at forvo.com. It’s easier to say Kapelmuur, “Chapel Wall” and just as acceptable. The French call it the Mur de Grammont and the French-speaking half of Belgium is only a few kilometres away. Travel and Access: Geraardsbergen is a decent place to stay but chances are you’re visiting the region to explore all that Flanders can offer the cyclist. If so nearby Oudenaarde makes a good base, it’s 75km west of Brussels, and has the Flemish cycling museum. If you want more scenery and entertainment beyond cycling then Gent is a great pick. Brussels is the capital and well-appointed with road, rail and air links it’s not a high city of cycling at all, the legends lie outside in Flanders and in the wooded Ardennes of Wallonia. Consequently Brussels probably isn’t the place to stay for a trip to Belgium if you’re cycling. A few cobbles around Cambridge, some fairly recently installed, but none on a gradient. I must try it one time as Belgium isn’t far away really. I hadn’t thought of that one. I live very close to it as I’m just off Huntingdon Road but I usually use Mount (un)Pleasant and Storeys Way to get anywhere. 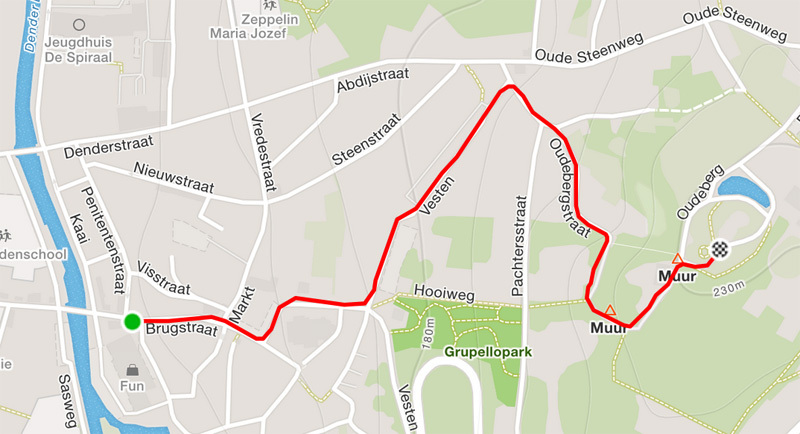 I was thinking of making a loop including Green Street, Kings Parade and Saxon Street and I’ll include Honey Hill as well and anything else I can find and ride it a few times before Tour of Flanders and P-R to get me in the mood. On a Sunday morning they should be pretty quiet. Only in Belgium would you get residents protesting for a bike race! Never in Oz. I did a 100k ride which was a succession of the classic bergs of the Ronde. The Muur was the final effort. I had tingles crossing the bridge into town. Swing left through the square and up. A real effort. And then the dive right into the trees. All you hear is your labored breathing and the imagined screaming of drunk, cycling mad fans. Finally light appears as you pass the cafe on the left and the Chapel looms framed by the sky behind. One final grunt up the ramp to the right of the Chapel before freewheeling back down into town for cake and beer. A great day out enjoying the insane sharp bergs of Flanders. If you are going to make the effort to go and ride the area, you must ride the Muur. And then you too will regret its exclusion from the Ronde. Was that on an organised trip TDog? If so, have you got a link? I’d love a trip to Belgium this Spring / Summer. Larry’s link below looks fantastic but a tad on the rich side for me perhaps. Don’t take this personally Ecky, but you bring up a good point. I find it interesting in a world where the merits of bicycles priced over $10K are routinely debated, $2795 for Velo Classic’s L-B-L weekend is considered expensive. Maybe it’s because I’m also in this business, but having seen plenty of these events on my own (Paris-Roubaix, Lombardy and MSR to name a few) I recognize the value of the logistics provided by the tour operator. Just showing up with your cycling gear (+ pedals and saddle) and having an expert like Peter take care of the rest is worth every dollar, especially when it’s in a foreign land you don’t know very well. Italy’s my backyard in a way, but I’ll let an expert on Belgium take care of me pretty much every time. I hope a couple of INRNG readers might join us? Not being a rider, I’m always staggered by the price of bikes. Are people honestly saying that they’re significantly faster on a $10k bike than a $2k bike? And who are you trying to beat? $10k seems madness unless you’re a pro (and then you get a free bike anyway): it’s a bicycle – for that money, you can get something with an engine (ask Femke). It’s probably safe to say there’s a greater performance differential between a $1k bike and a $2k bike than there is between a $2k bike and a $10k bike. People routinely spend a lot more unnecessary money (i.e. above what they actually need) on cars than on bikes though, and if folk want to to drop their hard-earned on something sporting, I’n happy they’re choosing a bike. Thing is, when you, the rider, are the engine, the greatest difference by far will come from fine tuning yer good self than any amount of money on a bike. A person who is 15 kilos overweight on a 6 kilo bike is worse off than a person in top condition on a 12 kilo bike. I’m a fine one to talk, by the way. Worst of both worlds at the moment! You hit on the key word – HONESTLY and the answer is pretty much NO. One can buy a pretty decent bicycle these days for $1000 if you shop around. I just found one on another cycling news site’s DAILY DEALS page, a 2015 Vitus bike with aluminum frame and carbon fork, Shimano 105 bits and under 9 kg. Sure it’s 2 kg heavier than the $10K+ bike but unless you’re racing up a pretty steep hill, you’d likely never know. If you took Cancellara’s Trek away from him and made him ride this he’d very likely still kick a__ no matter what the marketing mavens would have you believe. It’s all going off-topic. As far as I’m concerned if you ride up the Muur on a $10 unicycle or a €10,000 bike it’s great. Ride what you enjoy. 10k on a bike is ridiculous. It wasn’t an organized ride. I was visiting a client. He set me up with two of his leg breaker young employees who live in the area. Rented a bike for the day. Great day out for a middle age guy chasing young guns. Highlight was beating one of the guys up the Koppenberg. The other guy crushed me. Lots of fun. Great area for riding. PS – special street signage shows all the bike routes. Makes self guided rides easy. Good point on the signs, they have cyclist height small signs showing the name of the climb and the stats (length/ % etc) and bike routes. Many thanks all, and very helpful pointer with the signage too. Larry, no offence taken and I understand your points. My short to mid-term employment situation is questionable at the moment, so I’ll have to watch the pennies. I look on in great admiration, and envy, at your riding lifestyle. 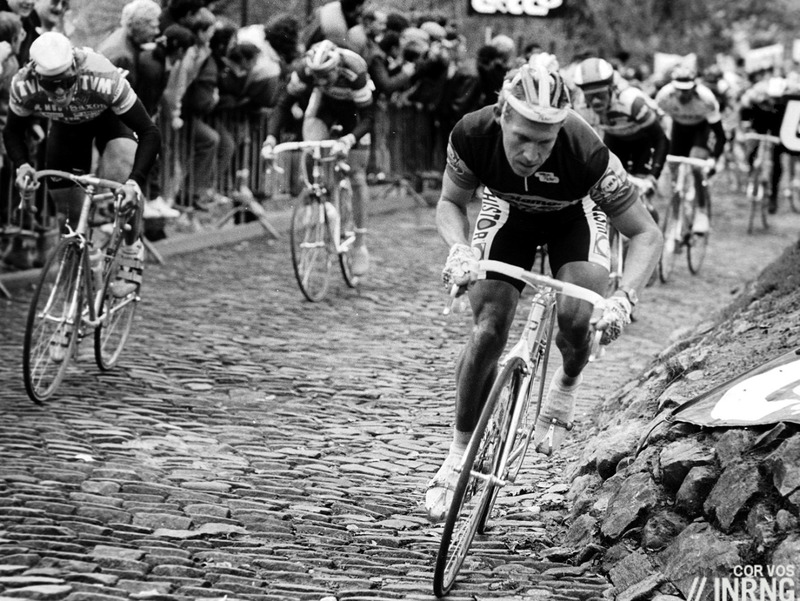 The Muur is indeed not the toughest climb, but it’s tricky at points. Especially when the cobbles are wet. At the steepest section, you can’t get out of the saddle or you slip, so you have to stay in the saddle and push yourself up the Muur. But if you’re coming to Belgium for a cycling holiday, I would also advice on Oudenaarde, way more climbs at your doorstep. Plenty of choices: cobbled climbs, tarmac climbs, cobbled flat sections… Plenty to discover. That or the Ardennes, where you have some real nice climbs. Tell you what, start in Oudenaarde and ride your way to Bastogne, or Huy. Should make for an interesting ride 😉 New classic a-brewing? Which club do you ride with in Gent, Ian? quite a scene actually! once a year they al battle at the ‘koers op rollen’ (race on stationary trainers). As for the clubs, there’s the infamous scheldepeloton and also the more social clubs like spaak&spier (my favourite), robocyclo and the celtic deliriums. The 2015 (and the upcoming 2016) Transcontinental race started with a climb up the Muur before heading off all the way to Turkey. Locals and spectators lined the route in their hundreds, the lit flames of there torches casting swarm flicker and a wall of noise as we headed up to the chapel. All this at a midnight start!!! Rode this last year and loved it. There’s no doubt it has a certain big-time feel. Although not that long in the grand scheme of things, you definitely appreciate how desperate it would feel in a race when approached at high speed with tired legs. I love the banner in the protest photo that says: De muur, voor echte venten, Oudenaarde voor tenten en centen. Translation: ‘De muur’ for real men, Oudenaarde for tents and money. Cheers for the translation. Great encapsulation of the difference in perspective between the fans and the organisers. Which is ironic as the Muur was dropped from the route following a dispute between the organisers and the town of Geraadsbergen which was rooted in… hospitality tents. is boonen getting dropped by cancellara there? More interestingly (for an Aussie), great to see a photo of the ground breaking Phil Anderson hanging on for dear life. I think it’s the 1989 Het Volk (Het Nieuwsblad today) and that’s Etienne de Wilde attacking on his way to the win. would it be that time when Etienne de Wilde won Het Volk by shortcutting through a gas station? Great guy this de Wilde. I think he was also very good on track. If I remember well he won points race in the worlds once. Even though the climb is in Flanders, I like the French name as well – Mur de Grammont. My personal favourite is kappelmuur… Le Mur is for the one in Huy!!! What I have never understood about this climb’s exclusion from the Tour of Flanders is why, given it is so close to everything else and given the fact that the ToF is such a long long race why they don’t at least direct the race over it earlier, before the circuit starts. Based on a Google maps survey, it isn’t that far from the current action. Certainly not a decisive position but it would still keep the tradition alive and make the fans happier. Can anyone shed any light on this? As the protest shows the locals, including the mayor, enjoyed hurling insults at the new Ronde management team. The race won’t go back in hurry… that said the Omloop does and it’s run by the same Flanders Classics team. 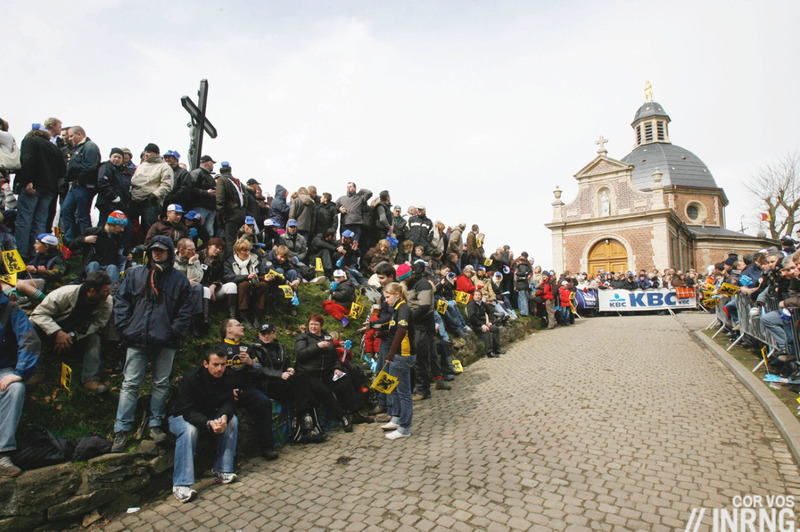 The dispute was rooted in who pocketed the dosh from the hospitality at the top of the Muur, Flanders Classics wanted it as it was their race, Geraadsbergen wanted it as it was their hill. The organiser threatened to take the race away, the town said they were bluffing. They weren’t. Even though I live in Brussels, I still get a thrill riding round the Ronde landmarks. The Muur always has to be followed by the (deceptively hard) Bosberg – it’s just the way it’s done 😉 There’s also a decent coffee stop at El Faro at the top of the Bosberg. On the Muur, it’s also worth taking a peek inside the chapel too. Next post: Which Races Will Katusha Miss?